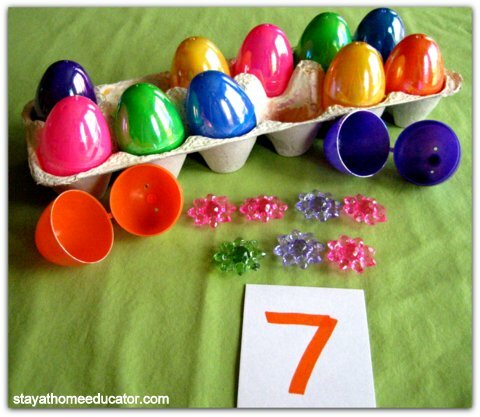 Today’s post is featuring seven easy and inexpensive Easter themed math activities, as well as the phonemic awareness and phonics lessons from Preschool Co-op Week 22. 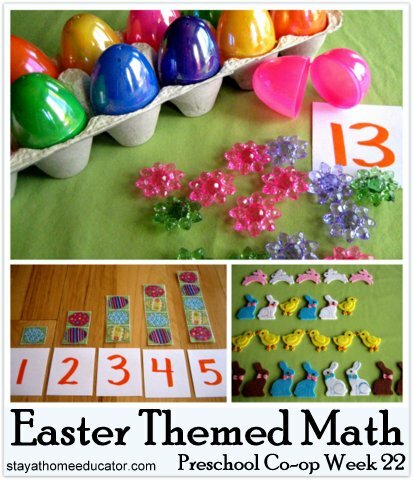 Easter Egg Counting: Number Sense (One to One Correspondence) – As I was searching for colorful manipulatives to use for out Easter activities this year, I came across some fabric that was decorated with Easter eggs in a grid-like format. 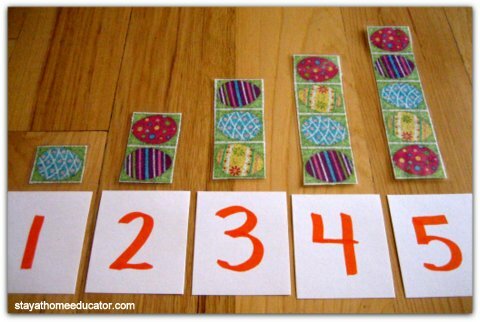 I cut out various lengths of the fabric, following the grid pattern, and laminated the strips, to make manipulative strips for the numbers 1 through 15. 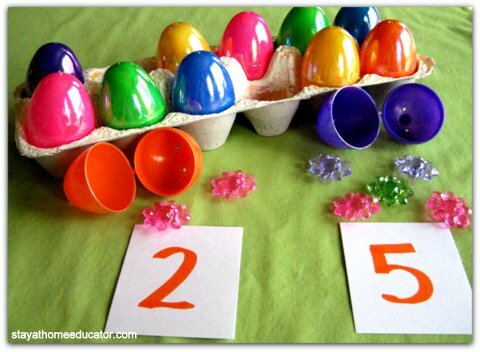 Using index cards with the numeral printed on, I invited William to count the eggs on each strip and match the number with it’s numeral. 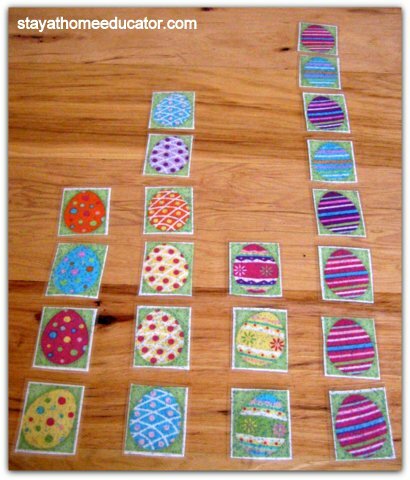 Sorting Easter Egg Patterns: Algebra – Using the same fabric as mentioned above, I cut out individual eggs for this sorting activity. 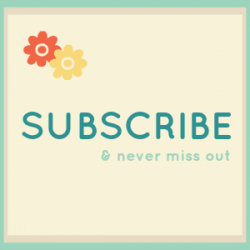 Some eggs had polka dots, some had stripes, and some had both polka dots and stripes. I invited William to sort the eggs according to their patterns. This was a challenging task at first since the third group of eggs shared attributes with the other two groups. Easter Egg Graphing: Data Analysis and Probability – I always find it makes the most sense to invite a preschool aged child to graph information only after he has sorted it himself, so it was only natural at our house that once the eggs had been properly sorted that William would line them up the graph them. As you can see in the picture below, we added a fourth row of eggs, those with flowers on them. 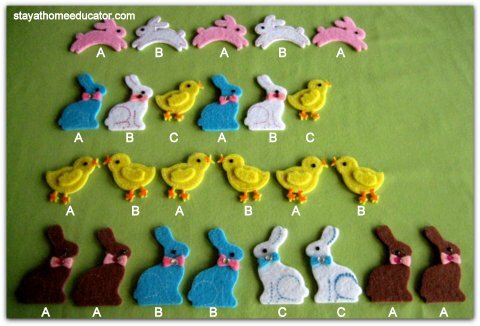 Easter Patterning: Algebra – This week, since I had purchased some cute felt bunnies and chicks at the craft store, I introduced William to some different kinds of patterning. 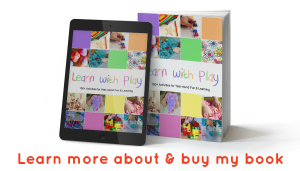 In particular, I wanted to expose William to the idea that patterns are not just AB or ABC, but some patterns can look very different from what we have previously been studying. While exploring these little manipulative myself, I found there were several challenging patterns, even a challenging AB pattern. 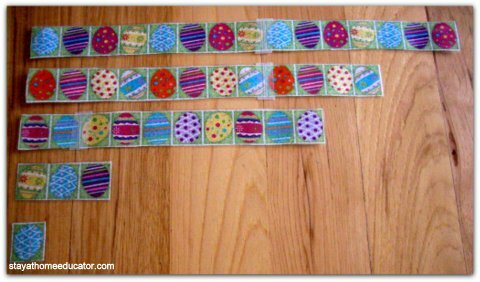 Comparing Easter Egg Strips: Measurement – Using the same strips of fabric from the activities above, I selected 5 or so out of the 15 for William to organize according to length. 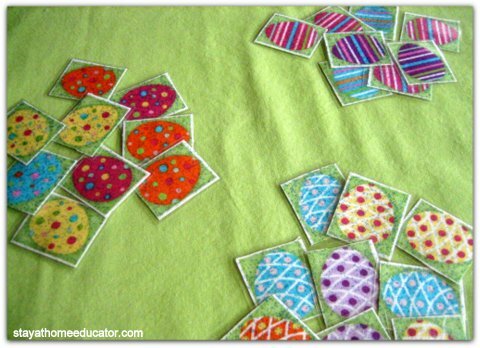 After he had them lined up properly, we counted to eggs on each strip and shared that with these strips more eggs equals longer strips of fabric. 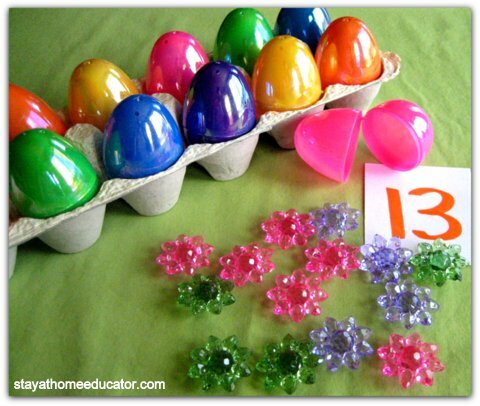 Easter Egg Addition: Number Sense – For this activity I packed twelve eggs with various amounts of flower table scatter and used the numeral cards from the counting activity described above. I invited William to select two eggs from the carton. He opened the first, counted the contents and found the matching numeral. Then he opened the second, counted the contents and found the matching numeral. Then I invited William to add all the table scatter together to count the final amount. Phonemic Awareness Skills: Medial Phoneme Isolation – Students learned to listen for the middle sound in a set of cvc words given. 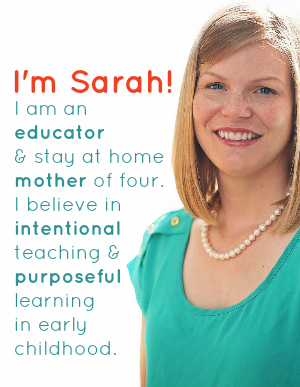 The teaching mother instructed the students to identify the middle sound of each word after she said them. For example, if the word was “sip”, then the students would identify /i/ as the medial sound. Phonics: Letter Hh – Students learned to identify the letter Hh and it’s sound. The teaching mom used several color photos beginning with the /h/ sound. Examples: house, horse, hammer, hat, helicopter, etc. Students practiced saying each picture name, emphasizing the /h/ sound at the beginning. After the above, the teaching mother used a random assortment of pictures from letter previously introduced and invited students to name the picture and it’s beginning sound and then sort them accordingly. 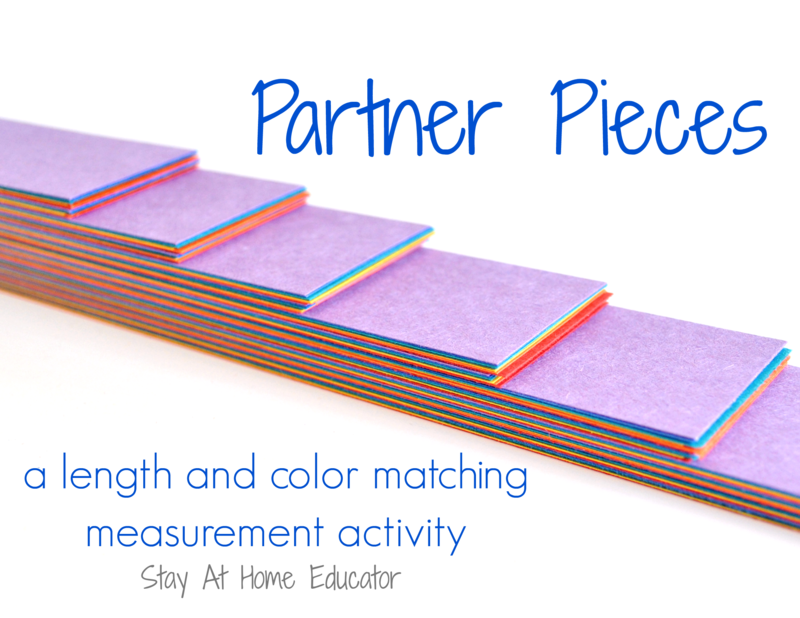 I love the graphing activity – it’s so powerful isn’t it? nice and beautiful display for the kid.I think it helps me a lot with my work because back at my kindergarten we doesn’t have those kind of display like you do it at your kindergarten.